WordPress WooCommerce Marketplace Auction plugin will enable the auction feature in the marketplace. Using which sellers and the admin can add auction in their products and the buyer can bid on their products. By using this plugin, the admin, and the sellers can add four types of auctions which are standard, incremental, automatic, and reserve auction. Note: It will work for Simple, Variable and Virtual product type only. WordPress WooCommerce Marketplace Auction Plugin is an add-on of WordPress WooCommerce Multi-Vendor Marketplace Plugin. The seller can add standard, incremental, automatic, and reserve auction. The admin can add standard, incremental, automatic, and reserve auction. The customer can place the standard bid as well as an automatic bid. Email for every outbid customer when new bid placed. All types of action can be applied to a single product. The admin has the option to show the current bid. The admin has the option to show all the bidders and their price. The admin has the option to show bidder name, bid, and details under automatic bidding. The admin/customers can see the auction bid list and automatic auction bid list. The admin can see the winner name for the auction. 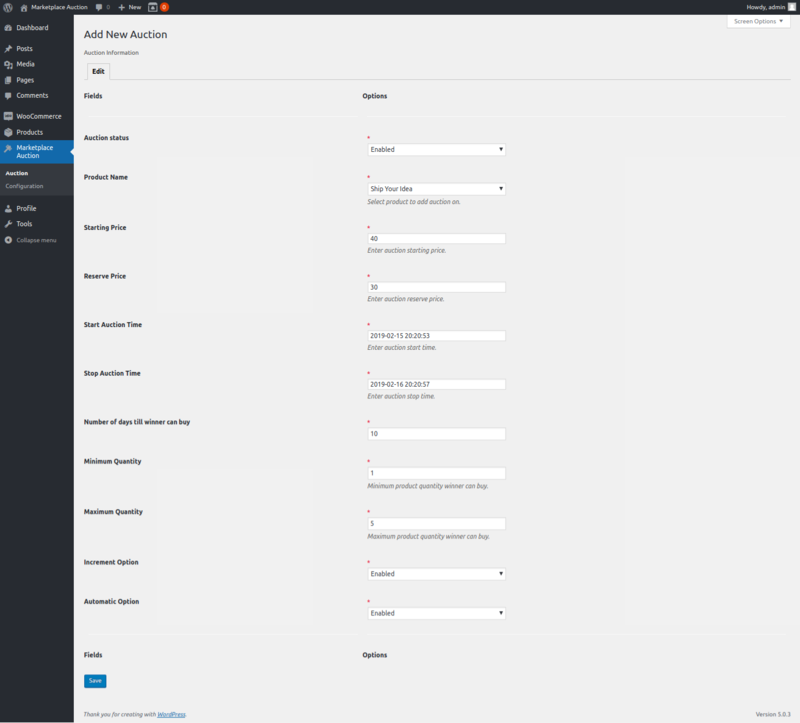 After the successful installation of the WordPress WooCommerce Marketplace Auction plugin, the admin can set the configurations of the auctions this under “Marketplace Auction > Configuration”. Let us discuss each Auction, individually. The configuration of the standard auction is very simple, from here admin can enable/ disable the plugin, set time zone and enable the auction bid details to show on the front-end for the standard auction. The admin can enable/disable incremental auction from here. By clicking “Set Incremental Price Range” admin can set the range of incremental price range as well. A new range can be added by clicking “Add New”. All the existing range will be visible over there. The Increment bid is the amount by which a bid will be incremented each time the current bid is outdone. Increment bid amount set will be done by the admin. You’re the first bidder on a listing where the starting price is $20 and you place a maximum bid of $40. Now the current bid is automatically incremented by $10 and then the current bid is $50. No one can place a bid less than $50. When a second bidder places a maximum bid of $110, the bid will automatically be raised to $15 and the minimum bid amount is $125. Admin can also enable or disable the Automatic Auction option with automatic bidder details, price, bidders, outbid messages. Let’s explain Automatic Auction using an example and winning cases. 1. When you(buyer) place an automatic bid with the maximum amount that you want to pay for the product. 2. The other bidders don’t know about other’s bidder automatic bid if disable by admin. 3. The other bidders place bids based on the current high bid. The bid will be placed until the bid meets the reserve price or until it expires. 5. If another bidder places the same maximum automatic bid or higher, then you will be notified by mail, so that you can place another bid. 6. If Your maximum bid is not exceeded by another automatic bidder or current bid, then you will win the bid at the current bid. 1. When buyer-A place an automatic bid with the maximum amount $100 that you want to pay for the product-X (reserve price-$60 and current bid price-$10). 3. The other bidder B place bids of amount $12 on based on the current high bid. The bid will be placed until the bid meets the reserve price or until it expires. now if many bidders placed the bid and now the current bid amount is $62. If at this position bid expires then buyer A will win the bid at $62 amount because he placed the highest amount bid and no one exceeded this amount. If another buyer C places the maximum amount $110 as an automatic bid, then buyer A will be notified by mail, so that he can place another bid and if buyer A doesn’t place any maximum bid then buyer C will win the bid at cost $62. If another buyer D places maximum amount $115 as normal bid then buyer C will be exceeded by current bid and he will be notified and if buyer C doesn’t place any maximum bid then buyer D will win the bid at cost $115. Under this auction, admin can set a price. If the auction does not reach to that price then no one will win the auction. For example, if the reserve price on an auction is set as 500 and bid is made till 499 then no one will win the auction. Here admin can enable the notification email to the admin, notification email to the seller, notification email to outbid buyer, and notification email to the winner. 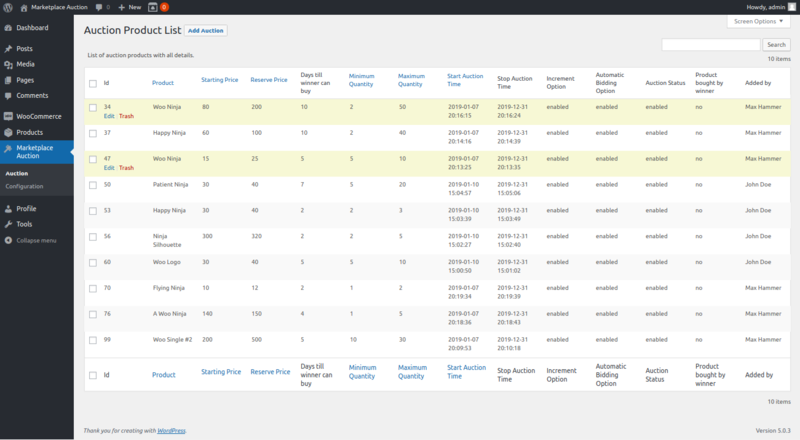 After configuring the plugin, the admin can set the background color of the auction details table. The selected color will be visible on the front-page. The admin can navigate through Marketplace Auction > Auction to add a new auction. The admin simply needs to click on the Add Auction tab in the Auction Product list page to add a new Auction. The admin view al the auction created under Marketplace Auction > Auction > Auction Product List. If need be, the admin can edit any auction by simply clicking the Edit option and even remove an existing auction by simply clicking on the Trash option available against the ID. 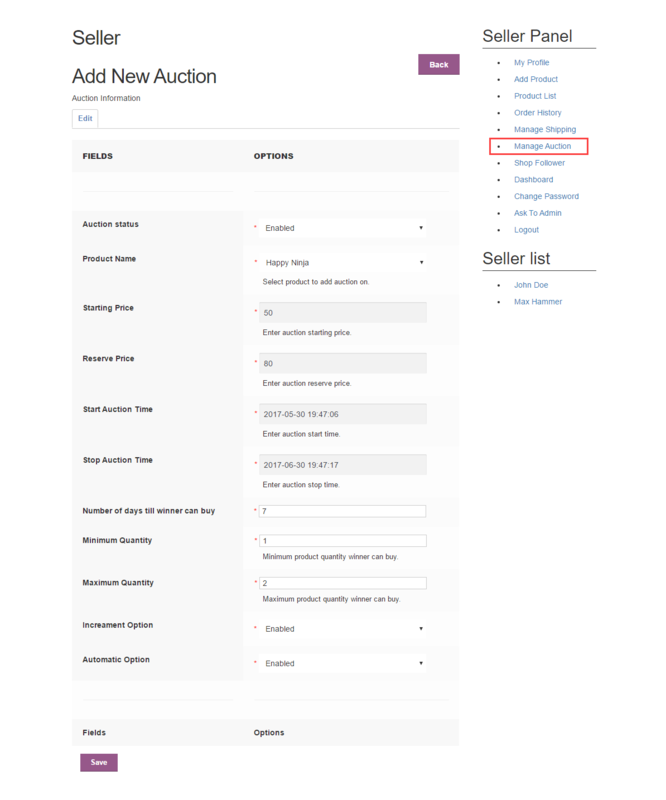 After the complete configuration of the plugin, sellers can see the “Manage Auction” option under their account section. After clicking on “Manage Auction”, sellers can see the products which are listed under auction. From here a seller can also add and delete the auctions. The seller can add a new auction product by clicking “Add Auction”. Thereafter, a new “Edit” tab will open where the seller can enter all the details to add an auction. All the auction products will be listed under “Manage Auction”. The seller can edit any auction by clicking on “Edit” button. The seller can view the normal bid list by clicking on “Normal Bid List” tab. The seller can view the list of automatic bids by clicking on “Automatic Bid List” tab. On front-end, the auction product will be visible as below image. An indicator will be added on top of the image so that the customer can easily identify the auction product. The customer can place the bid on the product page. If automatic auction enabled from the admin than the customer can place the automatic bid as well. The customer can find bid list and the auction detail as per the configuration like below images. After winning the auction the customer will be notified through the mail and can purchase the product. The customer can purchase the product as per the minimum and the maximum quantity defined in the configuration. The “Add to Cart” button available to add the product to the cart after winning the auction as below image.